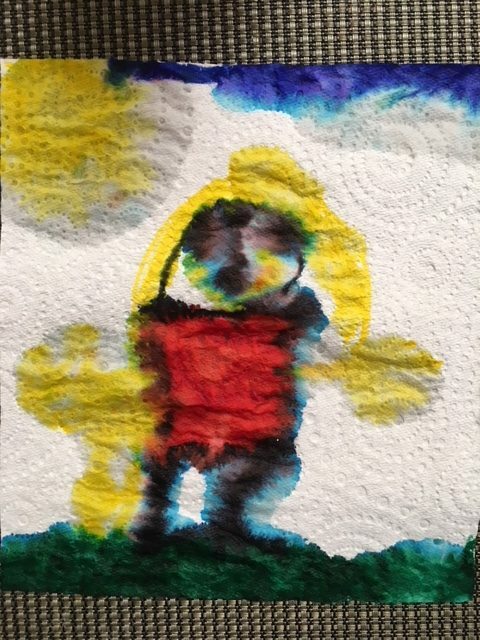 With the weather starting to change, we decided to have a go at some wet paper towel art. Oh my gosh, it was so much fun and addictive. Both my girls, Possum (aged 7 years) and Boo (aged 4 years) could draw and colour in for days. If ever I want to engage them in something quickly, I just have to get out the pencils and textas and they are away. 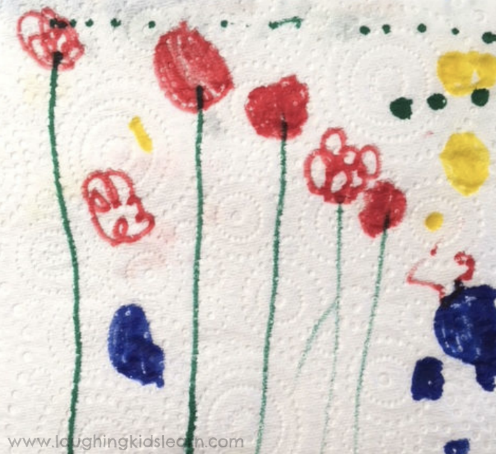 To extend their love of drawing, I had them create some gorgeous paper towel art. 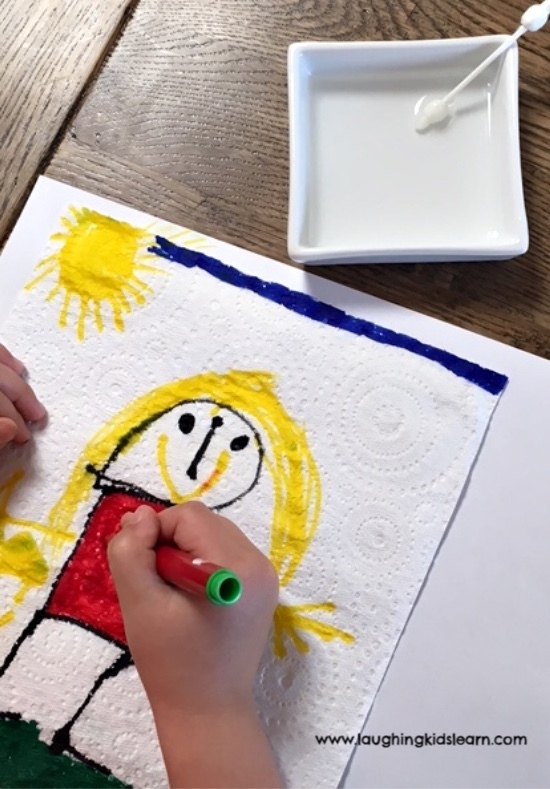 Paper towel art is wonderful because it transforms a child’s original drawing in ways they could not replicate themselves. 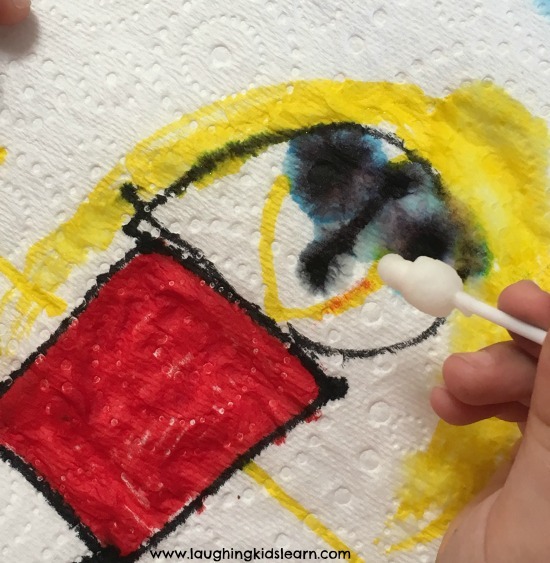 Simply have your child draw a picture on the paper towel. 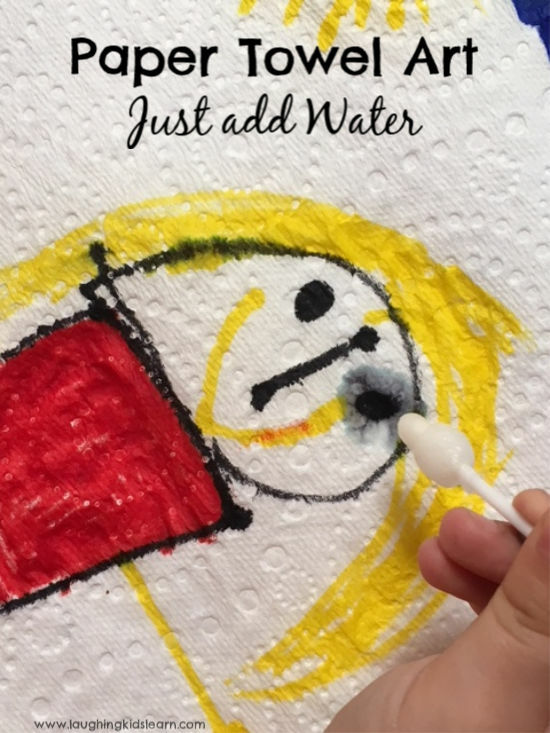 Next you’ll instruct your child to use the q-tip, dip it into the water and add drops to their picture. The picture will quickly start to change as the water touches the ink from the texta. You might like to prepare your child for what to expect of the transformation as their picture if going to change quite considerably. You don’t want them upset because their picture feels it’s being ‘ruined’ by the water. Explain that very soon their drawing is going to change and look completely different to what it did originally. You might like to show them an example using your own art picture. Soon you’ll find your child becomes quite fascinated with adding water to their various drawings and watching the water drag out the ink from the texts. The paper towel is an important part of why this happens. 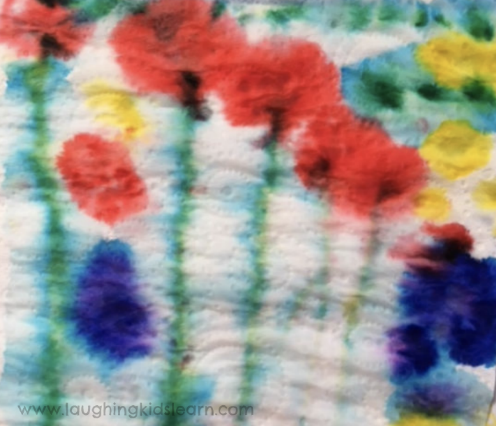 Suddenly a child’s gorgeous picture takes on a whole new look! It really is quite stunning how they turn out and it’s never really quite what you expect. All I know is, that you can’t stop at one picture. They also dry beautifully too. Is this something your child would have fun doing? What is a texta? Won’t Crayola Brand washable markers work? Hi Julie! Thanks for your great comment. I’m in Australia and we call markers, textas. Thank you for highlighting this to me. I appreciate that there are many names for a particular item. Hi Kate. I love your stuff. I live in South Africa and we call them Kokis or koki pens. 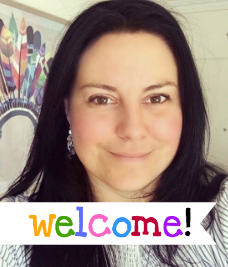 I have a playgroup at home for pre schoolers…age 3 to 6. Your ideas are fun, educational and economical as well as different. My daughter has moved to Canberra with her hubby and my 2 grandkids. She was the one who sent me this link. That’s so wonderful!!!! Canberra is lovely, I’m sure they’ll really enjoy themselves here Desire. You’ll have to come over to Australia for a visit. I’m from nz and we call them felts lol great activity I’m going to give this a go with our tamariki today!